Tag Archives for " GroupZap "
The ability to collaborate with individuals and groups around the world is one of the greatest gifts offered by the new breed of online tool. These tools, and perhaps the web in general, are evolving to become more interactive and feature rich. With the eventual adoption of HTML5 and its heavy support for AJAX, web pages are quickly becoming web applications in a foreshadowing of the next standard for web sites. Take note of these new tools as they will usher in the expectation that all sites begin to function instead of merely house information. Below are 5 new breed collaboration tools making heavy use of HMTL5. Groupzap – This one wins the coolness award in my book, but offers a really powerful set of tools for instant collaboration and brainstorming meetings and white boards on the fly. Marry it with Skype and you have a no cost tool that is hard to beat. You can drag files into the space, document with notes and save the entire session as a PDF. Nobody has to register you just send out a link via IM or email. Microsoft Office Web Apps – (okay, this one probably doesn’t use HTML5 as IE doesn’t add support for it until IE9, but it still fits the new breed label) – Using the Office Web Apps and SkyDrive you can open a document with a group of people and co-author and edit in real time with the entire group participating, making changes and viewing the changes live. TalkWheel – TalkWheel is an instant messaging platform that works more like a roundtable discussion than the linier stack of the typical IM. 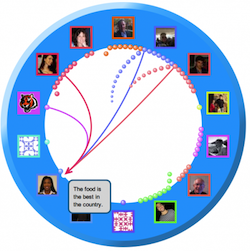 It actually create a visual representation of the conversations and filters and relates topics. Looks like a very cool way to keep track of conversations from around the web and I can see lots of focus group and brainstorming uses with its visual presentation. Vokle – I’m probably stretching how some might view collaboration with this one, but I just love what you can do with Vokle. Vokle is actually a live streaming video platform, but it makes it very easy to have two people present or invite virtual guests to create a talk show kind of feel. You can also share a computer screen as the guest to flip back and forth from live presenter to slides or images. The entire stream can be recorded for future playback as well.